If all goes well, when the Summer Olympics opens in Beijing in 2008 visitors will see a new, green Olympic athletes' center built expressly for this international event. The state-of-the-art, environmentally friendly building is being planned now with technical consultation from a group of U.S. energy-efficient building experts led by Joe Huang, of Berkeley Lab's Environmental Energy Technologies Division (EETD). The Chinese Olympic Committee intends to build a near-zero-energy-use building that incorporates advanced technologies such as efficient heating, ventilation, and air conditioning (HVAC) systems, daylighting to reduce the use of electric lights, internal and external shades and energy-efficient windows to reduce solar heat gain, and solar photovoltaic panels to generate some of the electricity the building will need. As the world's second-largest economy and energy consumer after the U.S., there's good reason for China to care about energy efficiency. Most of the electric power fueling China's rapid economic growth is produced by coal-burning plants. In the next 10 years, China could surpass the U.S. in greenhouse gas emissions. But China has a successful record of improving energy efficiency, dating back to the 1980s. Continued cooperation between the U.S. and China in energy-efficient building design and technology holds much promise for reducing emissions, with benefit to the economies of both nations. At the Olympic Games China will showcase itself to the world: one thing it wants the world to see is its commitment to improving the environment, fighting climate change, and designing with green and energy-efficient principles in mind. For Joe Huang, the road to the Beijing Olympics began in 1985, when he spent four months in Harbin, a city in northern China, teaching the use of DOE-2, a building-simulation computer program. Huang has considerable experience in using DOE-2 and EnergyPlus software to improve the efficiency of buildings. Starting in the late 1990s, with support from the San Francisco-based Energy Foundation, Huang began providing technical advice to the Chinese Ministry of Construction in its efforts to develop building energy standards. His first mission was to work with members of the China Academy of Building Research (CABR) to develop a building code for energy-efficient residential buildings in China's Hot Summer Cold Winter (HSCW) climate zone, a region that encompasses most of central China. 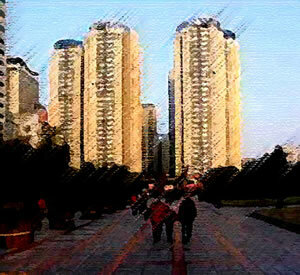 For several decades residential construction in China has been rapidly increasing. The rapid growth of new residential construction in China had prompted the Ministry to begin developing energy-efficient building codes in the 1980s. Cooperation with U.S. scientists allowed them to bring more advanced building science into their code development process. The goal of the HSCW standard was to reduce heating and cooling energy use by 50 percent compared to conventional construction (which typically did not include insulation or energy-efficient windows). Huang provided training and support in the use of the DOE-2 computer program, which allowed the Code Compilation Committee, headed by Lang Siwei and Lin Haiyin of CABR, to analyze for the first time the impact of energy-efficient strategies on cooling energy use in buildings. The Ministry of Construction adopted the HSCW residential standard in late 2001. Huang then worked with his Chinese partners to develop a code for residential buildings in the Hot Summer Warm Winter (HSWW) climate zone, which includes large portions of southern China. The Ministry approved the standard, which focuses on improving cooling energy efficiency in buildings by 50 percent, in May 2003. HSCW and HSWW standards both contain a performance option as well as a prescriptive option, meaning that builders can use a variety of technologies and design methods to meet them  the same approach common in building standards throughout the U.S. In fact, the scientific basis for codes in the U.S. is based on the same expertise. Scientists from Berkeley Lab's EETD and other researchers using DOE-2 helped develop California's Title 24 building code and the ASHRAE 90.1 standard for building energy use, adopted in numerous jurisdictions throughout the country. Huang's work on building codes went hand in hand with another ambitious undertaking: designing a showcase energy-efficient office building for Beijing. The goal was a building that could earn a high LEED rating (Leadership in Energy and Environmental Design), verifying its environmental friendliness and energy efficiency. LEED is a voluntary rating system developed by the U.S. Green Building Council to assess a building's environmental performance and ability to meet sustainability goals. The Agenda 21 Demonstration Energy-Efficient Office Building was a joint effort of the Chinese Ministry of Science and Technology (MOST) and the U.S. Department of Energy. The project began in 1998 and was completed in 2004. Huang was the principal technical adviser for the schematic design; using computer simulations, he completed a feasibility study in late 2000 that identified 20 energy-efficiency measures. Planned as the headquarters for the Administrative Center for China's Agenda 21 (ACCA21), a quasigovernmental organization responsible for China's greenhouse-gas mitigation program, the Agenda 21 building was to be located in the western part of downtown Beijing, overlooking Yuyuantan Park, the second largest green space in the metropolitan area. Eventually ACCA21 occupied two floors, with MOST's Science and Technology Promotion Center as the building's primary client. "The idea was to design with energy-efficient materials, space-conditioning systems, controls, and design principles that were judged to be widely replicable throughout China," says Huang. "Exploring the building geometry led us to select a cross-shaped building design to maximize daylighting potential, but with windows located on the north and south facades to better control solar heat gain." The U.S. analysis team was led by Huang and Ron Judkoff of DOE's National Renewable Energy Laboratory, who used DOE-2 to model energy use in successive iterations of the building's design. Their recommendations to the design team, headed by lead architect Gao Lin of the Beijing Urban Planning and Design Institute, were intended to lower the building's energy use by 40 percent compared to standard practices. Features included efficient lighting, low-emissivity windows, light-colored walls and roofs, energy-efficient chillers, thermal storage, and bi-level switching, allowing occupants to reduce electric lighting during daylight. In 2000, Rob Watson of the Natural Resources Defense Council spearheaded an effort to get U.S. companies to participate in the demonstration building by volunteering their technologies or equipment at no incremental cost to the Chinese partner. Ground-breaking took place in February 2002. Huang and Watson continued to work with U.S. manufacturers and suppliers, and with the architectural team and the owner, throughout a lengthy process of contract and construction (interrupted at one point by the SARS epidemic that overtook Beijing in mid-2003). The nine-story, 13,000 square-meter (140,000 square-foot) building was completed in spring, 2004. "According to the building manager, Yang Guoxiong, the actual energy consumption of the building has fully validated the computer simulations, with measured energy use less than half that of a typical office building in Beijing," says Huang. 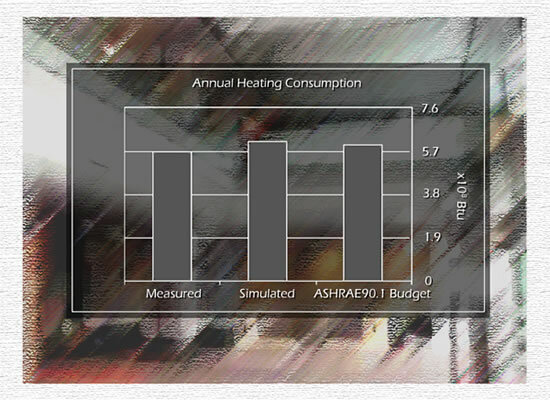 Measured energy use in the Agenda 21 building is not only more efficient than the ASHRAE standard but even more efficient than simulations had predicted. The U.S. Department of Energy, ministries of the Chinese government, and private companies are now in discussion about converting the second floor of the completed building into a building-energy technology center, with displays of energy-efficient technologies and an educational program including software training and invited lecturers from the U.S. 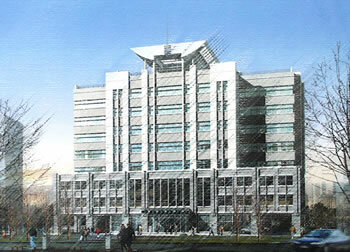 In 2005, Huang and Xu collaborated with the Natural Resources Defense Council to conduct a LEED analysis. LEED emphasizes sustainable site development, water savings, energy efficiency, materials selection, and indoor environmental quality. Initial monitoring suggested that, compared with similarly equipped office buildings in Beijing, the demonstration building uses 60 percent less energy per unit of floor area and 50 percent less water per occupant. In 2005 the Agenda 21 Building received the first LEED Gold rating for a building in China. Huang is proud of the building for another reason: the U.S. Green Building Council was not the only organization that praised the energy-efficient design. 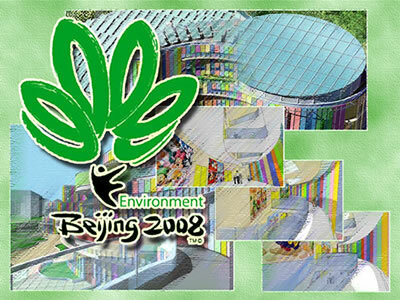 In 2004 China's Ministry of Construction gave the Agenda 21 Building its top award for best green building in China. "This honor was totally unexpected, and coming as it did from a different ministry, there could be no suspicion of bias or favoritism," says Huang, who adds that "in follow-up monitoring of energy use, the building seems to be performing better than I expected." The building manager is so pleased, says Huang, that he has become one of China's most passionate advocates for green buildings and energy-efficient building design. Huang's involvement in the Olympic Village project started in 2002, when the Beijing city government held an international symposium with representatives from the U.S., Germany, and Japan to discuss clean energy sources to power the Olympics. Out of that meeting came 10 U.S.-China joint working groups, focused on such topics as environmental protection, transportation, information technology, water, and green buildings. Two groups were charged with developing a green rating system for the Olympics and proposing an energy-efficient demonstration building. DOE's Policy and International Affairs office, in conversation with the Beijing Science and Technology Commission, identified a possible collaboration in 2004. Says Huang, "They agreed that we would collaborate in the development of the Olympic athlete's village," to include an international reception center. DOE offered to round up U.S. experts who could provide input in the design of the most efficient, environmentally sound building possible. The Guo'Ao Development Company was selected to build the Olympic Village, and after consulting with an international group of architects, commissioned a local design firm, the Tianhong Group, to produce the design. The Olympic Village will showcase China's energy efficiency efforts. 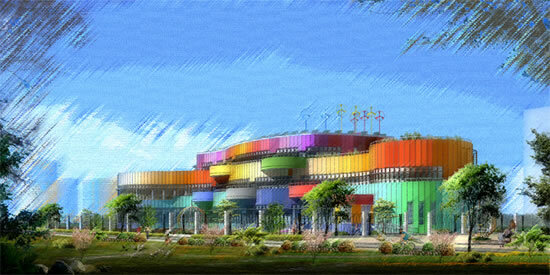 During the Games the 3,000-square-meter building (more than 32,000 square feet) will be a reception center and gathering place for athletes. After the Games are over, the athletes' village will become a high-end apartment development, and the reception center will become a kindergarten school. Building development and ownership is now heavily privatized in China, and the Olympic Games are no exception; Guo'Ao will continue as the developer of the Olympic Village and eventually intends to sell or rent all the apartment units. The design uses only curved walls. The architectural engineering department of Tsinghua University has proposed an innovative HVAC system that combines ground-source heat pumps, radiant floors, and desiccant cooling with active solar regeneration, as well as a seasonal thermal-storage system. In addition to Huang, other project advisors are EETD's Peng Xu and architect Bob Kobet from Pittsburg, who has more than 20 years' experience designing green buildings, especially schools. The advisors work with the design teams to ensure that the building fabric and HVAC systems are optimized for energy efficiency and are environmentally sound. In December 2006, Huang held a design workshop in Berkeley with leading local architects and engineers to evaluate the HVAC system proposed by Tsinghua. He then traveled with Kobet to Beijing to provide recommendations on the building and the HVAC system. Huang and Xu are conducting detailed computer modeling of the building and system to give the design team in Beijing quantitative assessments of the expected building performance. Huang has become a recognized spokesman for green building technology in China. Recently he addressed the international Energy Efficient Buildings Forum in Beijing, sponsored by the World Business Council for Sustainable Development and the International Energy Agency, exploring ways in which the developed economies and China can work together to improve the energy efficiency of new buildings in China.